Thankyou Shanlung what you said make sense to me I'll move the target around the table and see what happens. I didn't know you could put the stick in different places. I thought you should hold on to it. I'm off to give it a go. Well it started to work and he enjoyed it i was moving the stick around but after the 5Th time he flew to my arm climbed on to my shoulder and got happy again so i took him to the kitchen to calm down while wash up. I've left it 2-3 hour and tried again and after the 5Th go he was on my shoulder mating again. Am I correct in thinking that I should keep the training to 4-5 goes and then stop on a positive and do some more later? Others wrote in as can be seen from my reply. caregivers into a richer and more magical relationships with their companions. In addition to that, to the companions of those birdies still living in the wild, be they feathered, furred , or scaled. still sharing our planet on their precarious toeholds left. Please give to Gerald Durell Wildlife Trust or any other wildlife conservation body of your choice. If you are cash strapped now, think good thoughts to them. And when you have the money later, write that cheque to them. In 60-90 seconds bout of formal clicker training, with lots of head rubs and talking inside, how many clicks can you actually do? Not many. If Charlie decide to mate with you after 6 clicks, it will be wise to stop before that. If a bite or very serious misdemeanour, I advocate no nonsense and angry response from voice and heart. Not those idiotic 'must suffer in silence' to bite and oh! must not upset them hypocritical response that only will confuse them. In good relationship with humans or otherwise friends, those friends must be told the limit what is acceptable or not. Go read my understanding the mentality of grey for full details why. On affectionate gestures from Tink/Riam such as regurgitating for me, I did not regurgitate back for her. I cannot scold her for an affectionate gesture as that will be incredibly mean to do so. I quietly clean up and ignore that. Riam showed from time to time, she wanted to be mated by me. No relation to clicker training at all. I cannot scold her for that. I tossed her towards one of her perches that she flew to hang there a while to reflect on her own mysteries. She flew back sweet as before but with her ardour cooled. And if not cooled, another toss to the perches for her. Nothing special about being tossed to the perches. When I had no time, or no inclination, or when I decided to, and/or for the fun of it all, she got tossed to the perches. Tossed to the perch is neither good or bad or evil. Its just getting tossed to the perch. If you are aiming for a well trained bird, then you need to seek advise from someone else, not me. Do not win the battle and go on to lose the war and your soul and heart in the process. If you are aiming for a bird better bonded to you and you communicate better with, then that will be in line with my aspiration for you. I do not believe in more than 4-5 sessions of formal clicker training per day for that matter. Perhaps because I am laid back. But I do not think the more intensive the training , the better trained the birdie will be. Yet with my laid back style, all my birdies so far (except for LiBai as yet) did their stuff at cue with split second almost military precision. 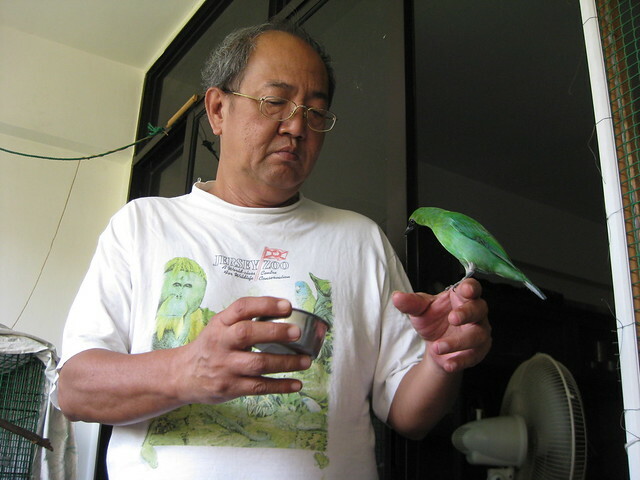 When many so called professional bird trainers decided it the bird respond within a few seconds, thats a good response. And they will urge one and all to train and train and train. What I mentioned what Tinkerbell and Riam do in that part of touch target, that should not be used as a yardstick for your birdie. No one told me I had to hold the target stick. I followed my gut feel to go on with all that you seen. Lots of the stuff I did, no one tell me to do. I made it up on my own. So should you. In 2001 I decided foraging will be good for Tinkerbell laying out goodies on top of cupboard etc etc. Kind of amused later that zoos also decided foraging for their beasties and birdies are good also. For all I know, maybe they read me and Tinkerbell. Foraging for Riam became more formalised largely because in Oman I found such nice and cheap clay pots and cups, and after my usual procrastinating about. Take what I say as a catalyst for your interaction with your own birdie. All birdies are different. 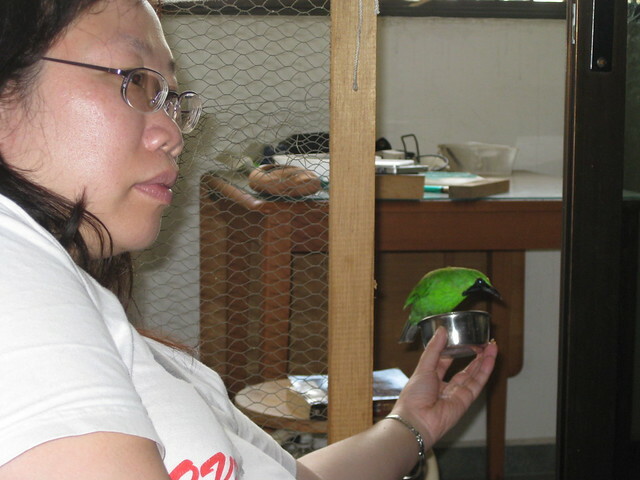 Let your desire and will to give a more enriched and fun filled environment for your birdie dictate what will happen. Not what other say or did not say. Trust yourself and your instinct. So because Tink flew and walked on wobbly perches and clawed and jawed to touch the target, your birdie might not do that. Besides what you seen of Tink was after intermediate steps and Tink was exceptional birdie. Riam would climb up (you seen the complicated perches I had for her) or down. But Riam was not Tink and would not do the incredible gymnastics Tink would do to touch target in contorted positions.. This training is more an exercise for you than for your birdie. You must learn to observe and ACCEPT what they do and prepared to do. Maybe you can nudge that ante a bit up to see if they do, but be prepared to back down if they do not. Pace should be their pace, and not a pace you set. Stop making your birdie repeat A for apple so rosy and red , which is what that initial touch target is about. Go on into words , phrases and making sentences instead of being stuck with A B C.
The target is a pointer. Not just a target to be touched. Use the target as a pointer, to touch other objects that then become a target that they touch. And how about handshake, or high 5? you need not use the target at all. Save the simple touch target as ending on a positive note and no more. You will find more explicit details how to use the target as pointer. And my failures. Learn from my failures. You might even succeed where I failed. And be one up on me. I will like that. I still have not started Li Bai on touch target yet. As you have read, the moment after I start on that, events will go so fast that I procrastinate still. I think LiBai will get on to graduate so fast that he be out of the flight room into the apartment. Except my apartment is not ready. I need to put up perches in living room, beaded hanging curtains and touch up on perimeter security, heck of a lot of work. Sadly, I cannot procrastinate much longer as it is getting more and more inane to condition the clicker and not move on. You have also seen the acceptance of LiBai coming to my hand holding the mash bowl. I like to make it clear the mash bowl was on the perch you have seen in LiBai's flight room most of the time. I noticed Li Bai might eat a bit, 2-3 grams, then flew back into the cage to digest preen and sing for 30-40 minutes, hopped out on the T perch on the cage door, and then repeat the flying to the mash bowl and eating as his routine. I do have other things to do. I cannot expect I hold the mash bowl and LiBai fly to me and eat. What if he just ate and no longer want to eat? I will be holding the mash bowl feeling stupid and looking stupid as LiBai go on to do his thing. So I do remove the bowl for a while, about 30-40 minutes as I do not know exactly which part of the cycle LiBai was in. So that when I go into his room, he should be ready to eat or so. 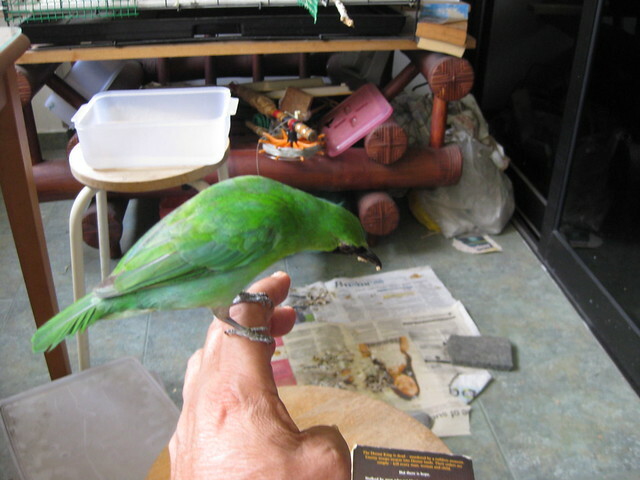 You have seen the slow stages how he was first persuaded to get nearer to me and then onto my finger. After which the bowl remained on that perch for him to eat as he pleased. Libai lately will fly to my finger in waiting for that mash. I already moved passed this holding of mash bowl phase other than doing that sporadically. I have a life to live other than just as a mash bowl holder for a little green bird. Yesterday though, my wife had a go at it. LiBai was reluctant to step on my wife's finger as yet. Since he gotten onto my finger to eat mash, I thought he should also fly to me to eat mealy worms. I decided against suris even though I knew he would love that as treats even more than mealy worms. I have already seen cricket escapees in my living room. I and my wife have this great aversion to suris as escapees. The other ideal treat is what I called millis. But millis are a by product of keeping suris. No suris meant no millis. And if you wonder what suris or millis , see below. Faint hearted folks are warned not to look at suris. LiBai is supposed to be a mimic. I should put in a sound system for Libai, perhaps with that haunting Sarawakian Sape music as I did for Yingshiong. To see if Libai can work that into his song the way Yingshiong did. So many things to procrastinate over and only one me to do all those procrastinating. Last Sunday my dear wife was not a work and able to do some shots, shots I could never do. 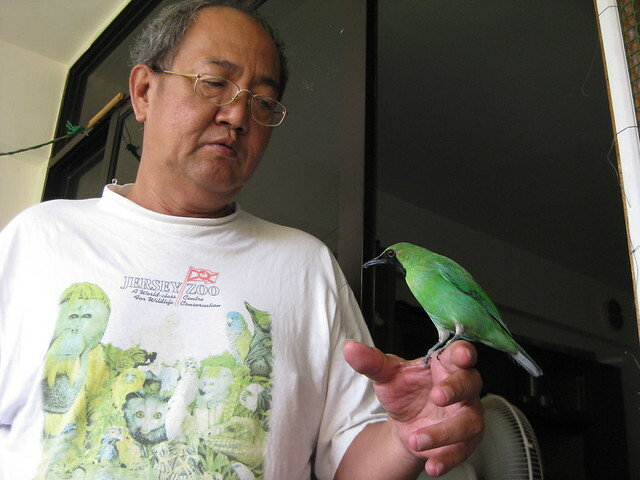 Li Bai flew so fast that his flight to take the meal worm and back to his perch was about a second or less. Dear wife new camera had this function to shoot slow motion video, which was about the only way that was captured. 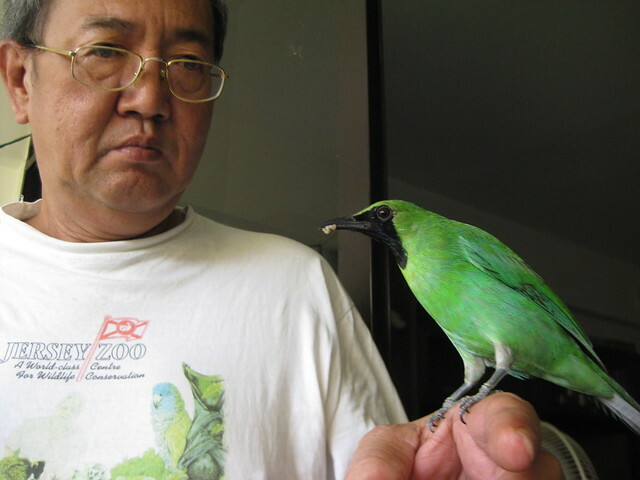 Li Bai flying to my hand and taking worm. LiBai also showed in a different way that he is getting to accept me. I could be adjusting things in his room. Not even with him near me. I was surprised a see a flash of green as he flew right in front of my head and then out of my view again. I guess that was his way of saying hi to me. I have a plastic container with some water on a stool for LiBai to bath in. He would fly into that tub for split second and out again. He would repeat that about 8-10 times. Thats the way he liked to bath. The trust this beautiful bird now shows toward you both is just wonderous to see. The slow-mow videos are just fabulous too...such a treat to see.